FILE - Construction workers assist in the assembly of a gigantic steel arch to cover the remnants of the exploded reactor at the Chernobyl nuclear power plant in Chernobyl, Ukraine, March 23, 2016. The plant is derelict. After the No. 4 reactor exploded in the early morning hours of April 26, 1986, its other reactors were gradually taken out of service and the sprawling complex hasn't produced a watt of electricity since 2000. Just a few hundred meters (yards) away from the hulk, hundreds of workers labor to construct a vast and remarkable structure that is to be the first step in removing the tons of radioactive waste that remain. The $2.3 billion New Safe Confinement project, funded by international donations and the European Bank for Reconstruction and Development, is a race against time -- though, unsettlingly, how much time can't be known. ​After the explosion and the fire that spewed a cloud of fallout over much of northern Europe, Soviet workers constructed a so-called sarcophagus over the reactor building, a concrete and steel structure aimed at keeping waste from escaping into the atmosphere. When the new structure, which resembles a 30-story Quonset hut, is finished, it is to be slowly moved on rails over the sarcophagus and reactor building. After that, robotic machinery inside the structure will begin dismantling the sarcophagus and the destroyed reactor and gather up the wastes to be transported to a nearby storage facility. Under current plans, that process is expected to begin in 2017. “The arch is now at its full height, full width and full length -- 108 meters (354 feet) tall, 250 meters wide and 150 meters long. It will act as a safe confinement over the No. 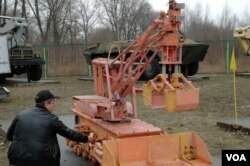 4 reactor, and it's planned to last 100 years … to give Ukraine a chance to dismantle the No. 4 reactor and make it safe forever,” said David Driscoll, director of safety for the French consortium Novarka that is building the shelter. Four kilometers (2.5 miles) from the power plant, Pripyat was built for the plant's workers. Opened in 1970, it was a model of the Soviet ideal -- orderly blocks of soaring apartment towers, the focal point a large plaza flanked by a sizeable hotel and the Energetik Palace of Culture. 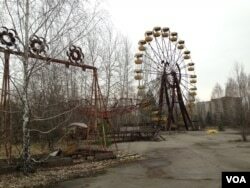 FILE - The Ferris wheel in the Pripyat amusement park, now an iconic symbol to a younger generation born after the Chernobyl disaster, thanks to its inclusion in the video game: Call of Duty 4: Modern Warfare. The 50,000 people who once lived there were hastily evacuated after the explosion; today the only human sounds are the tourist groups who come to marvel at the baleful remains, including a rusting Ferris wheel that was to start taking paying customers a few days after the blast. After the disaster, authorities established the so-called Zone of Alienation around the plant -- a 2,600 square-kilometer (1,000.86 sq. mile) tract where no one is supposed to live. But life of a sort continues in the village of Chernobyl, where workers who maintain and monitor the plant live on a short-term basis, often two weeks on and then two weeks away to minimize their exposure to the fallout that poisoned the soil. And a few hundred people who were evacuated from the zone eventually trickled back, more attached to their homes than concerned about radiation. If the desolation of the Chernobyl area is dramatically visible, the suffering of people affected by the accident is often near-invisible. About 600,000 people were conscripted into becoming “liquidators,” those who labored to put out the fire -- sometimes able to work for only a minute before having to flee the radiation -- or move contaminated vehicles to a dumping ground or otherwise clean up. But the dimensions of what happened to their health because of the Chernobyl blast are elusive. The Chernobyl Forum report headed by the International Atomic Energy Agency in 2005 said the radiation-related deaths among the 600,000 liquidators was likely to be about 4,000. The U.N. health agency has said more than 9,000 would die of radiation-related cancer and some groups, including Greenpeace, have put the numbers 10 times higher. The tensions between Russia and Ukraine are complicating the ongoing cleanup at Chernobyl, one of the world’s worst nuclear disaster sites, located in Ukraine, near the border of Belarus. Removing spent fuel and other highly radioactive materials will take decades and cost many more billions of dollars, a tremendous financial burden for Ukraine.